Sci-Fi…Dragon…GIMME GIMME GIMME! 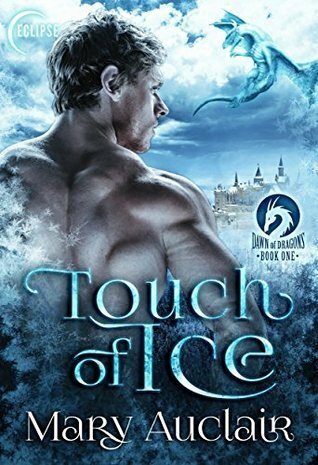 These were the thoughts that went through my head when I saw Mary Auclair’s Touch of Ice the first in her Dawn of Dragons series. In Auclair’s series Earth has been taken over by an alien race, the Delradons, who now rule over both themselves and humans. The Lords and Ladies of the Delradons have a deep bond with a dragon, which extends their life span and makes them more powerful than other members of their race. However, they have difficulty having children and so everyone is tested for generic compatibility. Those who have compatible are offered riches to mate and have children with them, the down side being that only about 50% of the women survive carrying the babies and giving birth. This is where Endorra comes in. Endorra is desperate. Her daughter is dying, but she’s barely scraping by and can’t afford to pay for the treatments that will save her. The only thing of value she has is a letter stating her genetic compatibility to Lord Aldric Darragon; Endorra knows that if she agrees to bear his children she will be paid generously and thus be able to pay for her daughters treatments. Even if she doesn’t expect to survive the experience. Of course, nothing is ever simple and Endorra and Aldric have an instant attraction that makes their relationship more than just a transaction. That’s where things get more complicated and interesting. Well, kind of, I really liked the idea of this book like I said: DRAGONS! ALIENS! These things make me happy. However, there are a few devices that Auclair used that drive me insane. One of those things is miscommunication or deception when there’s no need. This is something that the heroine engages in and although at first I understood her reasons and condoned them, it got to a certain point where it no longer seemed necessary. The second thing is when a heroine does something completely stupid that endangers her and in this case her young child as well. Now, this was clearly done by the author to move the story along. However, it was completely out of character and stupid, so much so that it seems unfair to judge the heroine’s entire character on it. But I can’t help it. But, despite these things I did enjoy this book, it had a good amount of world building and action in it as well as romance, which made it an exciting read. Perhaps this wasn’t the best start to the series, but there was enough there that intrigued me that I am looking forward to read the next book. I love this cover. And even though miscommunication and stupidity are two of my least favorite traits in a story I’m going to try this. Thank you! Awesome review suzanne!!! Love dragons!!! Beautiful cover too!! On my tbr gr list!! Shared on all my socials!! Miscommunications that drag out are on the top of my annoy me list.